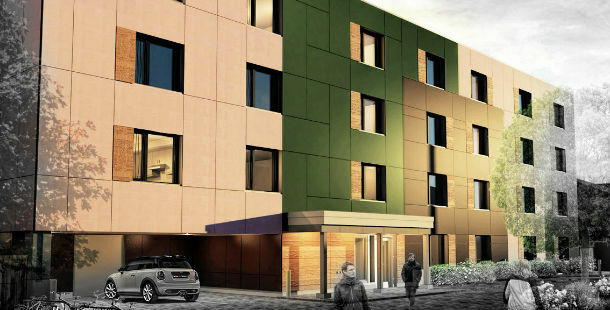 Ottawa Salus Corporation is making encouraging and innovative advancements in the fields of low carbon building and supportive housing. Through an integrated design process in 2010, the decision to design, develop and build a prototype building with both LEED Platinum and Passive House Certification was made, and a collaborative, exciting project was shaped. Simply put, the process has been very different from conventional construction in North America. To read a previous blog post on the basics of Passive House click here. By pushing the envelope, the Salus Clementine project represents a transition to a low-carbon method of multi-unit residential building. Knowledge and technology have come together and resulted in the development of a construction project under the leadership of the Ottawa Salus Corporation.The project team involved in the Salus Clementine project implemented a plan to construct a prototype building and develop new processes. To be an innovator in rental housing construction, future institutional backing could be provided through Canada Mortgage Housing Corporation’s (CMHC) innovation fund. Released at the end of September 2016, the fund is aimed at encouraging innovation in rental housing development. CMHC’s innovation fund is well timed. Developing innovative approaches to building housing products for the market may be a necessary outcome. Canada has plans to ratify the Paris Agreement, where low carbon building strategies are top of mind for the green building industry, with goals to reduce energy demand and develop actions for investments. Supportive housing organizations have often used innovation approaches in their histories. Ottawa Salus Corporation demonstrates this through their willingness to take smart risks and their belief that everyone deserves equal treatment in society. Salus chose a highly energy efficient building approach to lower operational costs so that funds can be reinvested into Client programming. In addition to overall savings in operations and maintenance costs, a sustainably-built environment provides healthy spaces to live, work and play. The equity to develop this type of project from a charitable perspective includes several layers of financing, beginning with a robust fundraising strategy, a winning government grant application, and an interested private lender who built their strategy around the organizational strength of Ottawa Salus Corporation. Future funding mechanisms to build a prototype building in Canada could also include social finance tools, such as community bonds, to increase opportunities to access additional equity. Cahdco has been able to manage this project by having an expert team providing advice and conducting feasibility studies and risk assessments, by giving assistance regarding the best practices in innovative construction products and methods, including evaluating conformity to regulations and other standards. We can help reduce the environmental impact of construction developments and provide information and advice on aspects of sustainability.